JLA Party rentals was formed in 2011 and has been family owned and operated since then. Its name came from the initials of our three kids at the time. At that time we had experienced bounce house rentals from other companies that provided outdated equipment and decided to invest in our own for our kids. We then had friend and family that began to tell their friends about our bounce houses and they would ask us to rent them out and thats how we ventured in to the party rental business. Even to this day its owners still are actively involved in the business and from handling calls to going on deliveries. Most of our inventory as been kid approved as our kids are the ones who usually pick out what new units and services we add to our company. 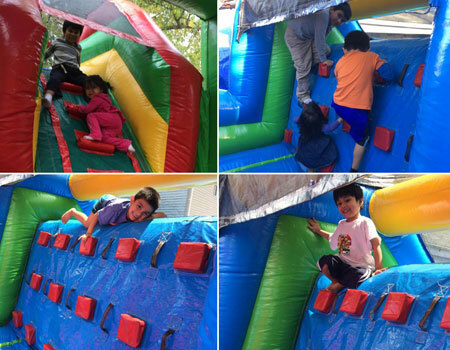 JLAinflatables.com is dedicated to providing the best customer service and high quality event rental equipment throughout New Jersey. With safety as our number one priority, we will always approach each event with professionalism, attention to detail, and strict ahearence to all safety procedures. That may mean that we will play a role in "Go or No-Go" decisions, hopefully with your understanding, that those decisions will be made with your's and your guest's well being coming first. We hope to be serving your event & party rental needs soon.